It is advised that security groups should be associated and configured appropriately with your AWS RDS instances which will make your cloud environment more secure. Why is it important to configure security groups in your AWS RDS properly? AWS allows the users to attach security groups to their RDS instances. A security group is like a firewall that controls the inbound or outbound (incoming or outgoing) traffic for your instances. If no security group is assigned to an instance in, then the instance automatically gets assigned to the default security group of the VPC which allows public access to all the associated resources. Any security group having an IP address as 0.0.0.0/0 means that it allows unrestricted or public access. AWS RDS instances contain multiple databases which store sensitive data for the users. Any security attack resulting in any data leak or any operation disruption would create an unwanted situation for the user. It is recommended that any security group allowing public unrestricted access should not be associated with any AWS RDS instance. 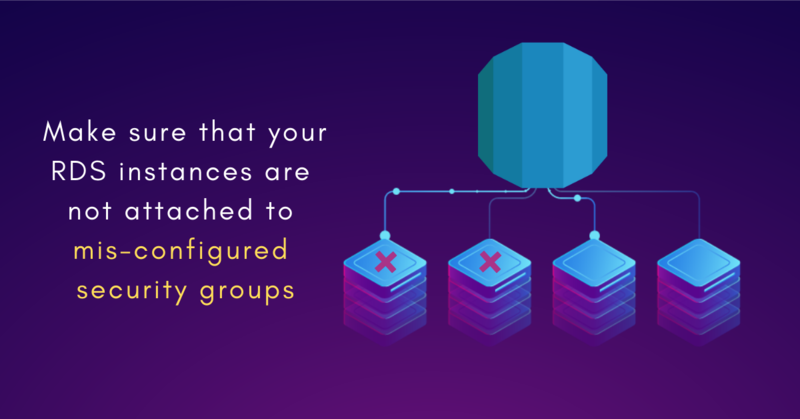 Centilytics has a dedicated insight which gives warnings to the user whenever any AWS RDS instance with misconfigured security group is detected in the cloud infrastructure. OK This indication will be displayed when the corresponding AWS RDS instance is secure and does not have a misconfigured security group allowing public access. CRITICAL This indication will be displayed when the corresponding AWS RDS instance is not secure and has a misconfigured security group allowing public access. 1.Account Id: This column shows the respective account ID of the user’s account. Account Name: This column shows the corresponding account name of the user’s account. Region: This column shows the region in which the resource exists. RDS DB Security Group Name: This column shows the name of the security group attached to your RDS instance. RDS DB Security group Status: This column shows whether your security groups attached to RDS instances are secured or not. Account Id Applying account Id filter will display data for the selected account Id. Resource Tags Value Applying resource tags value filter will display data which will have the selected resource tag value. For e.g. – Let’s say a user has tagged some resource by a tag named environment and has a value say production (environment: production). Hence, the user can view data of all the resources which have “environment:production” tag assigned. The user can use the tag value filter only when a tag name has been provided. Did you know that the snapshots of your AWS RDS instances should not be publicly accessible? Read here.